Check Trail Conditions before you go. We will update alerts on Facebook ‘Bennington Area Trail System- BATS first and the BATS homepage if we have time. Trail Descriptions at the top. Parking locations on the map, and at the bottom of this page. We request that large groups avoid parking at Stark Street. Thank You! Report any less than ideal trail conditions to us at batsvt @ gmail.com or message us on Facebook. See Trail Rules & Guideline Page for more important information. Carriage Road – 0.4 mi. (Beginner, Yellow Blazes): Is a Beginner friendly trail which takes you along the old access road to the Everett Mansion. An old stone cobble road leads to an overlook with excellent views of the Vermont Valley, Battle Monument, and Green Mountains. Cave Trail – 0.6 mi. (Intermediate, Yellow Blazes): Connects the Carriage Road with the the Garlic Festival Field at Camelot Village. The Everett cave can be found just upslope from the southern portion of the trail. Everett Path – 0.3 mi. (Intermediate, Red Blazes): Starts at the south end of the Everett Mansion parking lot by the kiosk, and runs along the gravel road to the water tank. It then runs above the mansion cascades descending down to the Carriage Road. Fieldhouse Trail (Beginner, Orange Blazes): a mowed path that connects the SVC fieldhouse to the Carriage Road. If on a bike please use these narrower mowed paths, not the wide SVC XC team paths. Fillmore Forest- (Intermediate- Red Blazes): An extension of Halloween Tree and a fun connector up from the Garlic Fest Field/Vermont Land Trust easement. Connects to the Cave Trail or continue up Halloween Tree. Halloween Tree – 2 mi. (Intermediate, Red Blazes): Draws its name from an old growth burled sugar maple tree alongside the trail. The trail runs from the Carriage Road north of the Everett Mansion along the Northeastern flank of Mount Anthony, ending at the Garlic Festival field at Route 9 and Fox Hill Road. The trail was built in the Spring and Summer of 2016 and can be ridden in both directions. Hops and Vines – 1.2 mi. (Intermediate, Orange Blazes): was the first new trail that BATS built in the Fall of 2015. It was built with mountain biking in mind, but makes an excellent running, hiking, and xc skiing trail. It can be ridden both ways and runs from just south of the Everett Mansion down to Monument Ave by the Southwestern Vermont Medical Center. Lower Beacon – 1.75 mi. (Difficult, Green Blazes): Under Construction with landowner permission. Come to a volunteer work day. This singletrack winds along the contours and connects to Halloween Tree twice, or takes you up to the Lower Beacon where it connects to The Wall. Old Farm Road – 0.5 (Beginner, not blazed): Can be used to climb back up to the Everett Mansion area from Monument Ave.
Orchard – 0.5 mi (Beginner, Orange Blazes): a mowed path wrapping around the field edge from Old Farm Road connecting to the Northern side of the Fieldhouse. If on a bike please use these narrower mowed paths, not the wide SVC XC team paths. Ursa Way – 0.6 mi. (Intermediate, Purple Blazes): climbs a steep pitch above the water tower, and follows an old logging road, eventually descending down to an open field with expansive views of Bennington and the Green Mountains. It is best biked South to North. 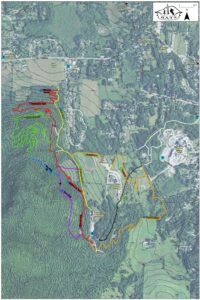 Hospital Trails (Beginner): Southern Vermont Medical Center has helped improve and expand their trail system adjacent to their campus. Most trails are well marked and make for excellent beginner biking and hiking trails. Sign with map at trailhead access points at Stark Street Playground, and on the SVMC Campus from Dewey Street.